The history week presentation regarding Australia's Heritage Quilts, at Penrith City Library by Dr Annette Gero, will take place on Tuesday 11 Sept at 1.00pm. The date was inadvertently left off the previous blog announcement. 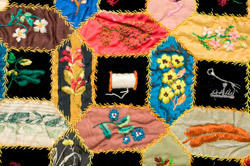 There are some exciting and varied exhibitions covering the topic of "Threads" as part of NSW History Week 2012 in Sydney and regional areas from Saturday 8th Sept until Sunday 16th Sept. Many of them will be regarding Fashion, however, Dr Annette Gero will be involved, and talking about Australia's Heritage Quilts. Mid North Coastal town Kempsey, 15 kilometers inland from the coast of the Pacific Ocean, is host to the Macleay Quilters' Inc Biennial exhibition. Quilters of this region near the Macleay River, have been industriously creating many quilts, and raffle prizes to share with all who wish to attend. There will be "The Presidents Challenge" to admire, trading tables, demonstrations, and a Merchants Hall. It's not too early to secure your place on the Annual Retreat! On Page 39 of the August 2012 edition of The Template, details of the weekend and a booking form can be found for the accommodation requirements you need at Jamberoo Valley Lodge. Send in your request ASAP if desiring specific room configuration. A special 'Quilter's Rate' has been organised with management. This is the Guild's Annual Retreat, giving any member an opportunity to have a fun and relaxing weekend of quilting, and guild community spirit. Further information can be obtained by contacting the Guild Office. Come and be part of this year's 30th Anniversary Celebrations at the Jamberoo Retreat! Heading "up the coast" next weekend? Then be sure to visit Coffs Harbour and attend the Annual Quilt Exhibition and Craft Fair being presented by Coffs Quilters and Needlecraft Inc. There will be a vast array of magnificent quilts and fine needlework on display, as well as a huge assortment of trading tables. Morning and afternoon teas and lunch will be available. The Southern Highlands Textile and Fibre Network Inc. announce their exhibition of Members work. Entitled " Diversity : Coast" this display will be at the BDAS Gallery, 1 Short Street, Bowral. Times : 10am - 4pm daily. The next meeting of The Quilters' Guild of NSW Inc. will be held on Saturday 18 August at Burwood RSL, Shaftsbury Rd., Burwood. Show and Tell : please bring your recent quilts. Block of the Quarter : please sew a "Spool" block or two, for the lucky recipient's benefit! . . . . . . Quilter's Treasure! Is your "studio / sewing sanctuary" awash with old magazines, hoops that have never hooped and ugly stash fabrics acquired during forgotten moments? Do orphan blocks and strange thimbles reside with never used patterns and old silk ties? Are your cupboards bulging with stuff that might have been inspirational . . . . but now you've moved-on? Is your space crying out for a make-over? Then book a trading table for only $5.00 at Market Day and offload some of your embarrassments! To book a table at the 18 August 2012 General Meeting, Phone the Guild's Office or email the Meeting Co-ordinator. Market Day will commence at 11am in "The Dome" at Burwood RSL. 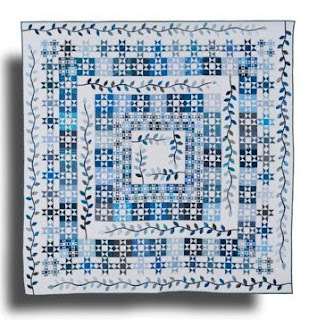 However maybe something equally as quirky was used as your inspiration for The 2012 Guild Challenge "Pearl"
Time is running out to send your completed 60cm x 40cm quilt to the Guild office. Please make sure your quilt arrives on or before the 7th September with a 6cm deep hanging sleeve attached to the back. Either Landscape or Portrait orientation is acceptable. "Pearl" Challenge Quilts will be displayed initially at the Annual General Meeting of The Quilters' Guild of NSW Inc on the 13th October 2012 at Burwood RSL. Viewers Choice will be determined on that day. All quilts will be retained for a Suitcase Exhibition, touring for 26 months, and available to groups on request. On Saturday the 21st of July, Margaret Sampson George spoke for the Quilt Study Group of NSW about Medallion or Frame Quilts. There were 68 in the audience in the Target Theatre at the Powerhouse Museum to hear Margaret Sampson George talk about her introduction to sewing and quilting, her love of medallion quilts and then to see examples of her work and those of her students. Margaret discussed the historic reasons for the popularity of medallion quilts, the development of fabrics from the 1500s on (especially the quilt centres based on pastoral, floral, military or commemorative panels) and the importance of medallions for commemorating important dates in the makers’ lives. For members of The Quilters' Guild of NSW Inc. there will be a lengthier report on this event and further photos in the next edition of The Template. Reminder : Book now for the next workshop with The Quilters' Guild of NSW Inc and enjoy an informative day with Pam Holland as she imparts her Thread Painting skills. Pam Holland is an Internationally renowned quilter and teacher, author, designer, illustrator and photographer, whose visual and artistic journey, through the means of her blog, is a delight and inspiration for all of her many followers. There are further details of the topic for this particular workshop, on this specific blogspot. A workshop booking form will need to be sent to the Guild Office for members to be part of this workshop. 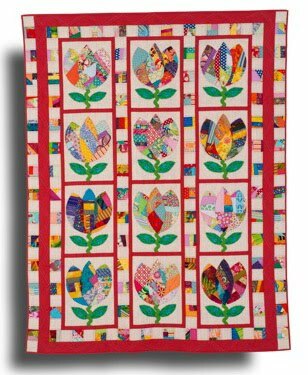 If you were unable to see the "Fertile Imagination" Challenge Quilts at Darling Harbour this year, then why not view them at the Craft and Sewing Show in Newcastle? This Challenge was arranged in association with Expertise Events and the Newcastle viewing will be the final public display of these quilts. 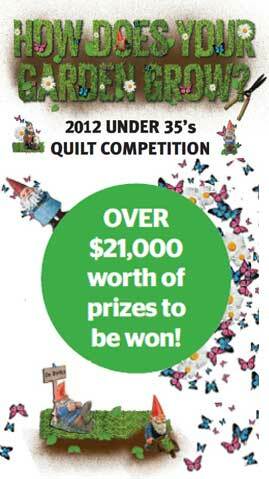 All Fertile Imagination Challenge quilts will be returned to their makers, after this exhibition closes.